…managing mud puddles (in Lent)…. Muddling our way through Lent, we’re almost half way done. Easter is just 3 & 1/2 weeks away(!) …but yesterday (another dreary rainy day) i got stuck in a mud puddle funk. Ok, so sometimes maybe we don’t WANT to wallow in mud puddles, but we’re stuck. Can’t see our way out. All those negative tapes in our heads keep hitting ‘replay’ – down, down, down we go into the depths of the mud, our minds pushing us into stickin’ thinkin’ of all that’s gone wrong with us, to us, in us. The thing about Lent, we need to nourish our hearts & minds & spirits with sparkling mercy & grace flowing from the wounds in Christ’s hands, His feet, the lashes on His back, the thorn marks on His head. Jesus can lift us out of the mud… but we’ve got to do our part. We’ve got to stop splashing in the mud puddles where we are & let Christ lead us to the shores of new lakes, where His love will carry us through whatever waves may come. Yes, it may be hard to leave our shallow mud puddles where it’s easy to paddle & there’s no risky depth to manage … but Jesus wants us to go deeper with Him, in Him, for Him. This entry was posted in Lent, Life (in general) and tagged Cross of Christ, faith, God's love, Jesus Christ, Lent, mercy, mud puddles, overcoming despair, Psalm 40:2, spiritual desire, Treasures in jars of clay. Bookmark the permalink. 5 Responses to …managing mud puddles (in Lent)…. 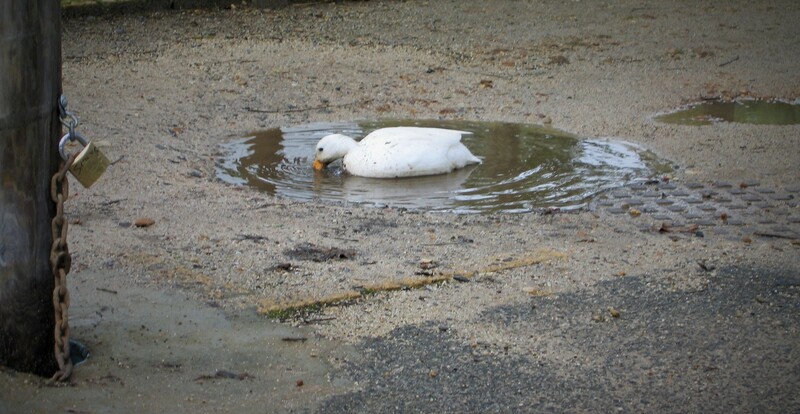 Can’t believe you got that pic of a beautiful spotless white duck in an ugly puddle of mud…a stark contrast that sends a vivid message. I’m up for “mud puddle management”! This morning Dwight said i should get a degree in “Mud Puddle Management” but i told him i already have a Masters. What’s so amazing about this pic – i took it in the parking lot of Groot Constantia, the oldest (& one of the most beautiful) wineries in South Africa. Absolutely gorgeous surroundings & here was this beautiful duck in a mud puddle!